Shely Salemnia, a CSUN dietetic intern at Cedars-Sinai Medical Center, is a master’s student specializing in nutrition and cancer care. Photo courtesy of Shely Salemnia. Nutrition always has been a big part of Shely Salemnia’s life. She grew up in a health-conscious family and developed a passion for helping others. Salemnia is in her second year of the Master of Science in Human Nutrition program in California State University, Northridge’s College of Health and Human Development. She is focusing on nutrition and healthy eating for cancer patients. She was inspired to pursue a career in this field when her mother was diagnosed with breast cancer while Shely was an undergraduate at New York University. Through her family’s journey, Salemnia said, she realized that working in nutrition and oncology would allow her to help others. “Even though I was just starting out as an undergrad with basic nutrition knowledge, I used my class time to learn things about nutrition and cancer,” Salemnia said. “I would spend extra time on aspects of nutrition that could benefit cancer patients, and try to help my mom in that way. Salemnia knew she would end up in a science field. Salemnia discovered the master’s program in nutrition at CSUN through her work at Cedars-Sinai Medical Center, where she started a job as a clinical Dietetic Technician in 2015. 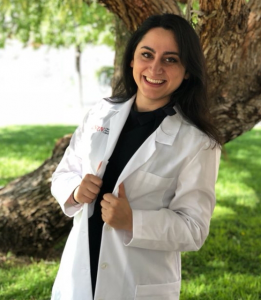 When she was admitted to the university in 2017, she was matched as a Dietetic Intern at Cedars-Sinai, which meant she could stay with the hospital to complete her internship rotations. The rotations are designed to help graduate students learn various aspects of work as a dietitian, such as working in a clinical setting in hospitals; educating different communities about healthy eating through rotations at Women, Infant and Children (WIC) programs; gardening classes at elementary schools throughout the San Fernando Valley; and managing food-service operations at a hospital. 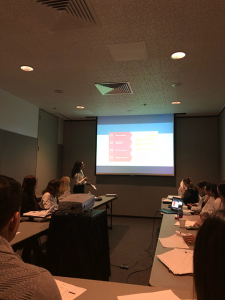 CSUN dietetic interns are required to complete 1,216 hours in supervised dietetic practice, including required hours in Spanish learning and practice, nutrition research, developing a business, and program creation. Cedars-Sinai has played a central role in Salemnia’s family — she was born there, and her mother received her cancer treatment at the medical center. When she completes her degree, Salemnia said, she hopes to work in an outpatient facility such as Cedars-Sinai’s Samuel Oschin Comprehensive Cancer Institute. As a graduate student, Salemnia has expanded her passion for nutrition and research, thanks to her professors and advisors. “Within my first year at CSUN, I met with Dr. Elizabeth Sussman, the graduate advisor, a few times,” she said. “I also went to Dr. Dena Herman, professor in the Department of Family and Consumer Sciences, Nutrition and Dietetics, for help and she really urged me to pursue my research as my master’s thesis. Dr. Annette Besnilian, who runs the dietetics internship program [and serves as executive director of CSUN’s Marilyn Magaram Center for Food Science, Nutrition and Dietetics], is also an amazing resource. I can depend on her for anything. Herman described Salemnia as an exceptional student. The professor taught Salemnia in her Graduate Research Methods course. Shely Salemnia, a CSUN master’s student in nutrition, presents her research on diabetes. Photo courtesy of Shely Salemnia. Salemnia is currently wrapping up her last year at CSUN. She is working on her thesis project, studying the cardioprotective benefits of orange wine — wine made from fermented white grapes with skins left on during maceration — in comparison to red wine, focusing on antioxidant capacity and polyphenols. Red wine contains polyphenols, which are known to prevent heart disease. Rosalia Garcia-Torres, an assistant professor in the food science and administration option in CSUN’s Department of Family and Consumer Sciences, is advising Salemnia on her graduate thesis. Garcia-Torres noted that Salemnia is in the process of analyzing samples and generating data. Salemnia recently completed her CSUN/NVHC/WIC Dietetic Internship and is studying for the exam to become a Registered Dietitian-Nutritionist, which she is set to take by the end of summer. One of the greatest benefits of studying at CSUN has been the sense of community, she said.